Kaylee Dalton is an "art crush" I met on social media. I can't recall how I originally came across her work, just that I loved it immediately. We quickly became mutual admirers and I am thrilled to be able to introduce her work to the WoArt crowd. She uses a combination of multiple techniques and materials to create these stunning organic visually stimulating works on paper and board. Rich in texture, pattern and unabashedly "feminine." I just love it, and hope you enjoy getting to know her and her work better too! There’s an obvious influence from nature in your work, but for you, it seems rather specific, particularly plants, maybe even specific plants? I find this really interesting over the broad spectrum of influences that nature can provide, you are rather focused. Can you tell us how that began for you in your work? And if there are particular plants that you prefer to draw inspiration from, how those plants came into your life? Is there a conceptual/philosophical connection in your work to the plants you choose to work from that you want viewers take away? Plants are captivating and intriguing. I’m particularly fascinated with new growth. They are always moving, growing-either becoming weaker or stronger. I love that we don’t see it happening in real time. You go and check a plant the next day and it’s grown a whole new batch of leaves or blooms have opened. It’s mysterious and exciting! I try and mix parts of leaves, stems, roots, and perennial bulb formations to convey consistent growth. I’m also attempting to blur the line of the above-ground plant parts and all the interesting “behind the scenes” bits in the soil. I like drawing the same kind of plant leaves so they aren’t so specific or recognizable to a particular plant. They have kind of morphed into my own as I’ve viewed my indoor plants. I love when art blends and blurs the lines between one medium or process to another. Your work on paper is like encaustic painting meets collage meets printmaking…can you tell us a bit about your process? It also feels very explorative, yet at the same time controlled. That restraint is difficult for a lot of people, can you tell us a little about that, how you decide a work is finished, when to hold back and refrain from “over-working” a piece. I painted consistently with encaustic on panel for 8 years. I love encaustic. Painting with hot wax is unlike anything else. It’s very manipulative, forgiving and seductive! My husband built my panels. I was working on pegboard because I liked the holes and I got impatient asking him for more boards to be made. So, one afternoon I thought I’d try an encaustic monotype. I had no new panels ready, but lots of paper. I had taken a monotype workshop in college but never used it. So I thought well go for it! I paint with the hot wax onto a heated metal plate, lie down my printmaking paper use a brayer and release. It’s fast (instantly dry) and full of surprises. It never looks quite how you think it will “print”. This provides movement for my pieces and a good start for me with a sort of background image. From there I cut and tear watermedia pours/paintings collaging those in. I draw with marker, pen and my favorite: watercolor pencil. It’s very explorative. I’m always experimenting especially with the lines I create with the wax before I print and the watermedia pours –last week I mixed coffee grounds with watercolor and it turned out so cool. I am the kind of artist that doesn’t have plan. I don’t (can’t) sketch out an idea for a piece. It’s extremely intuitive. I love to let the materials show me something and from there I develop a world. I think it’s easier to tell if a piece is finished with collage work because you can ‘test’ a spot before you have to actually commit and glue! So for me, I place a piece down in a spot and take it away – if it makes no difference to the piece being there or not, then it doesn't get glued down. Usually by that point, if I feel nothing is going to make a BIG difference, then my piece is done. I stop before I just way over do it. Patterns also make frequent appearances in your work, from dots in the encaustic paintings to black and white stripes, (from fabric?) throughout your work. Can you tell us a little about the inspiration behind those marks? Is there a particular pattern or design that you have a lot of interest in working with or are particularly attracted to right now? Or on the flip side, one that you just can’t stand or have no interest in? I have been restraining myself from going and buying more types of fabric to collage in! Yes, the black and white stripes that are in each collage is fabric, everything else is paper. I think I’m building up my confidence and figuring out the best way to mix in patterns but more will come in the future I’m sure of it. I like bringing in the structured pattern just as a play against the organic, expressive and sort of delicate nature to the rest of the piece. I’m slowly introducing an upside-down V pattern in areas, I think I would like to explore that more. As for a pattern I dislike – I will never buy houndstooth for my work haha! Your work has a very feminine aesthetic, there’s a softness and color choices that are really very beautiful, something the Art World seems to be slowly embracing again after many years of “beautiful” having a negative connotation for fine art (particularly for female artists.) How have you had to deal with the “beautiful” to “conceptual” debate in your career, and what are your opinions on that subject? Or on the subject of “femininity” in art? I would say 95% of people that have purchased my work are women. So interesting to me. I try and create delicate lines and intimate color choices as representation for plants and women are instinctively drawn to that. For the longest time I would not use pink or in my work. I would only use a little bit of red or purple because I didn’t want my work to seem “girly” and I wanted to be taken seriously. Isn’t that sad? Honestly, it took me awhile to realize so many male artists used pink- deKooning, Diebenkorn…. Now, I really don’t care. I think you get to a point where you’re confident enough with what you’re doing. Never make work to please anyone else. I think that’s when the best work is made. With my artwork I don’t have a big statement I’m trying to make. I create because I can’t NOT create. The fact that people are interested and enjoy my work is purely a bonus. 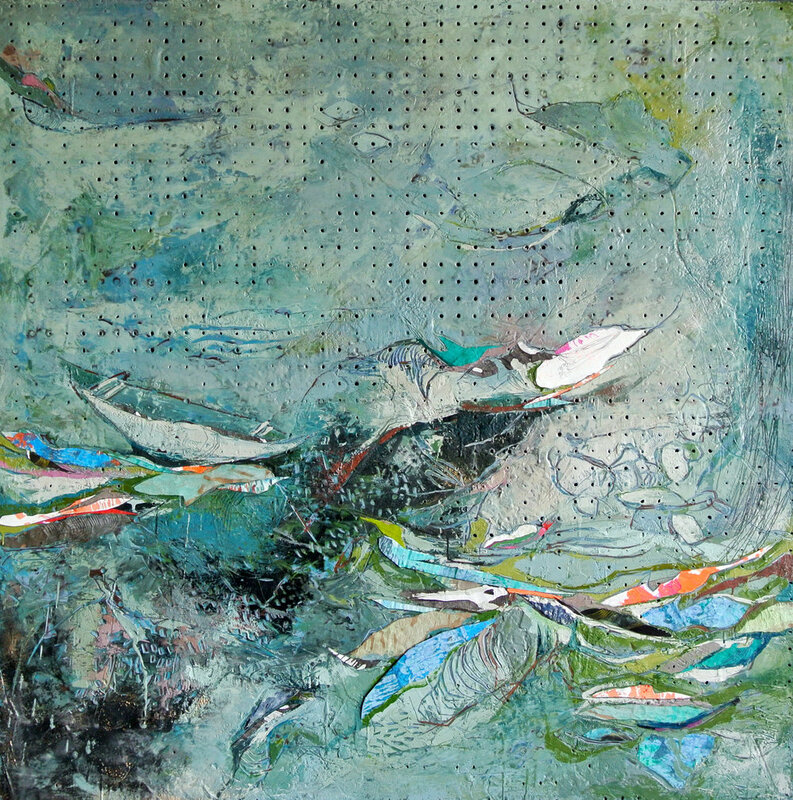 Marilynn Derwenskus- because she was my mentor and opened my eyes up to experimental watermedia and encaustic painting plus she’s made amazing work. Currently though- Seonna Hong! Do you have any upcoming events or shows that you’d like to share? I will be at The Other Art Fair (presented by Saatchi Art) in Chicago September 28, 29, 30 and a solo exhibition at the Indianapolis Arts Center in February 2019.